The following are questions we are most commonly asked about our appraisals and services. If the information you need is not here, please contact us and we will be glad to assist you any way we can. Our office hours are Monday to Thursday from 8:30 a.m. to 5 p.m., and Friday from 8:30 a.m. to 3 p.m.
We service all of Central and Eastern Ontario excluding the cores of the City of Ottawa and City of Kingston. We accept Visa, MasterCard, cash, certified cheques and Interac E-Transfer. The cost of an appraisal depends on several factors that may differ from property to property, such as the type of report needed and the intended purpose of the appraisal. The cost will also vary with complexity and size of the property. Once our appraiser has a clear understanding of these, he/she can provide you with a more precise quote. How long does it take the appraiser to inspect my commercial property? The average commercial appraisal inspection will take approximately one hour depending on the property size and type. Rural properties, large properties, properties with multiple land parcels and going concern or operating entities may require additional time. How long does an appraisal report take to complete? Appraisal reports are normally completed in 2 – 3 weeks from the time of the inspection. In certain circumstances, appraisers can complete their report more quickly. This often requires re-prioritization of workloads for which a premium is typically charged. What are the qualifications of your appraisers? 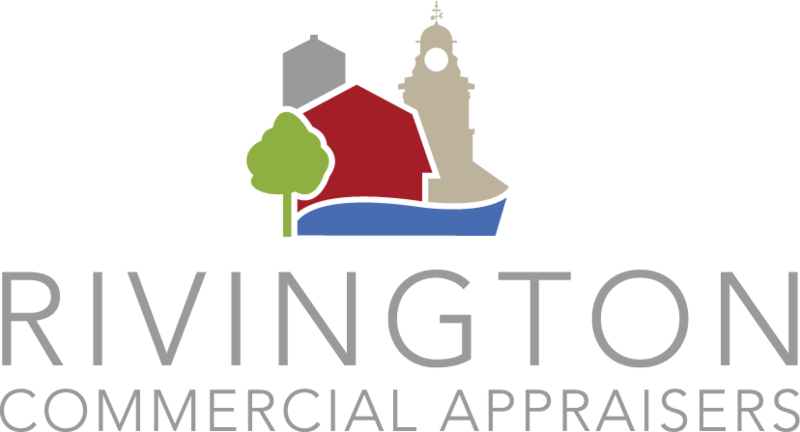 Rivington Commercial Appraisers has a staff of eight including two designated as Accredited Appraiser Canadian Institute (AACI). We also have candidate appraisers and a Reserve Fund Planner with the Certified Reserve Planner (CRP) designation. Our firm is also on all approved lender lists. Should I order a private appraisal or go through my mortgage broker or bank? When you order an appraisal directly from Rivington Commercial Appraisers, you are the sole owner of the report you receive. Copies can be released only with your approval. When a lender or broker orders an appraisal, on the other hand, he or she becomes the legal owner of the report—regardless of whether or not you paid for it. If you decide to change your broker or lender before a deal is made, you may not have access to the report. If I order an appraisal can I do what I want with it? The appraisal report is a legal document with a clearly identified purpose (for example, mortgage financing or divorce/separation). It can only be utilized for the purpose for which it was intended. How does an appraiser determine the value of a commercial property? Values are based on the condition of the property as well as recent market data on similar properties in similar locations. Whereas a real estate agent wants to place the highest value possible to achieve the highest selling price, our goal is to arrive at an objective valuation and provide a well-researched appraisal report supported by sales data. I had an appraisal done on my commercial property last year and I am now refinancing. Why does my bank require a new appraisal? An appraisal report is a point in time valuation valid only on the date indicated in the report. Since property values fluctuate with market conditions, a bank or lender may require either a new report or an update of the original report to reflect the current market value. What will the appraiser be doing at my property? The appraiser will walk through your property and take note of its features and upgrades; its interior and exterior finishes and condition; and its heating, cooling, ventilation, electrical and plumbing systems. The appraiser will also measure the exterior dimensions to determine the gross leasable area. The appraiser will need access throughout the property and will take photos of all major components as per the lender’s requirements. What do I need to do to prepare for the appraisal inspection? Write a list of improvements, additions or renovations you have completed in the last few years. We will need access to all rooms in the building(s) including your mechanical systems. If you have your tax bill available, it can verify the correct spelling of your name, street address and legal description of your property. If you have a large agricultural property, have a list of the parcels, their sizes, and which are improved with buildings or other structures. If we are appraising a leased property or a hospitality property, we will require copies of all leases and financial information including all revenues and expenses. Can the appraiser discuss the value with me? Appraisers are bound by professional rules of ethics which include a strict requirement for confidentiality not to disclose any information except with the client or the individuals/institutions approved by the client who ordered the appraisal. To discuss any information, we need written approval from the ordering client. Are there situations where I could have my property appraised, pay for the report, and not be entitled to receive a copy? Yes. Should your lender request a report for your property through a 3rd party appraisal management company, they receive our report. They provide the lender with the pertinent information such as the final estimate of value. The borrower typically pays for the report, but neither the lender nor the borrower typically receives a copy.